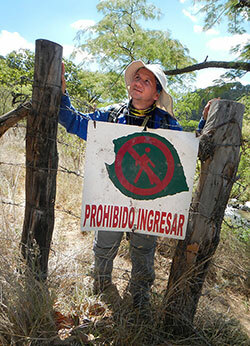 Not all the rivers at Rio Salado Balnerio are hot. 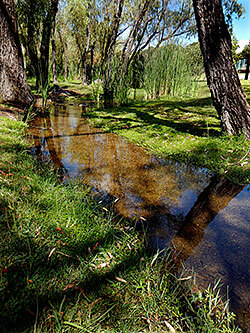 This cool, clean stream offers visitors a shady spot to picnic or read. 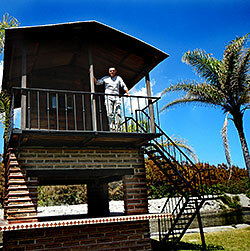 The office -- at Balneario Río Salado. 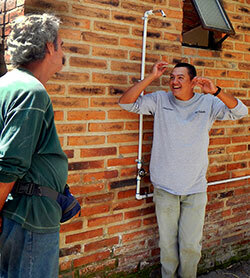 “Hot showers, cold showers, indoors or outdoors: we've got 'em,” explains Antonio Meza, caretaker of Balneario Rio Salado, to Albert Schmaedick, left. 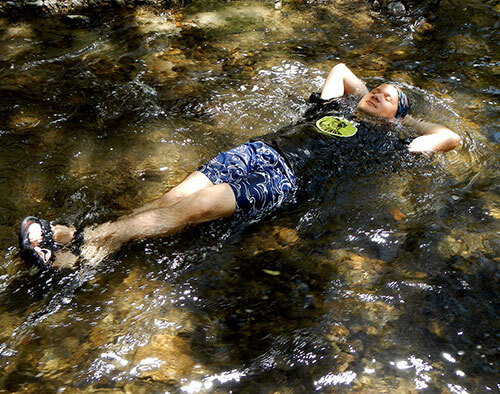 Albert Schmaedick relaxing in the Salty River, which is “rich in minerals and deliciously warm, but not hot." 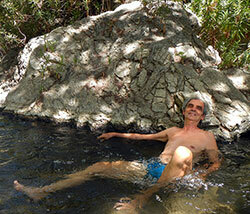 A camper at Guava Beach enjoys the delicious, cold water from a spring next to his tent. 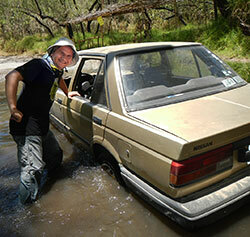 Outdoors blogger Jorge “Quercus” Robles pauses for a photo before trying to push his stuck car out of a suddenly swollen stream on the way to the Salty River. For years the stream has been only a few inches deep. 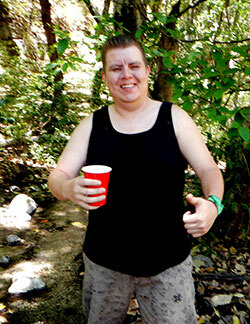 "Thumbs up for Guava Beach," says Jorge Quercus Robles. 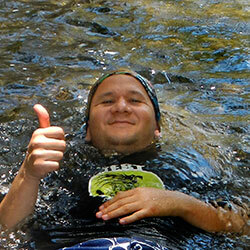 Check out his blog for more unforgettable outdoor adventures. “But how safe is it to camp there?” asked Albert. It´s a question everyone seems to be asking these days. 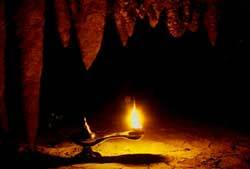 To find the answer, Albert and I teamed up with outdoorsman Jorge “Quercus” Robles, in a quest to find the closest “safe” camping area to Guava Beach. We decided to approach the river from highway 70 which passes through Ameca. A mere four kilometers from the paved road we came to Balneario Río Salado where friendly caretaker Antonio Meza welcomed us with open arms. “You want a safe camping site?” he said. “¡Aquí está! We have a big grassy area right here next to the Salty River where you can pitch your tent. And, of course, we have toilets and hot showers too, plus a guard and a locked gate. This wide grassy area at Balneario Rio Salado is reserved for camping. The cost is 75 pesos per person and includes the right to use clean bathrooms and showers and to spend all the time you want soaking in the Salty River. The caretaker told us their beautiful recreational area is open every day of the year and assured me it is both peaceful and practically deserted on weekdays. The cost for camping here is only 70 pesos for adults, 35 for children and there's no charge at all for petting their tame boar, Chancho who will gladly gobble up your leftover tortillas. "It´s still here! 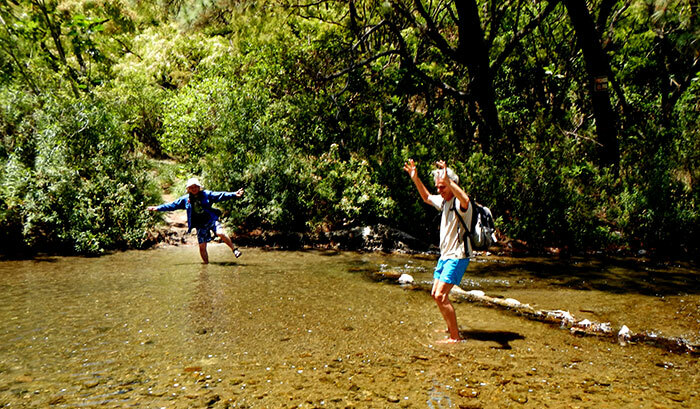 Jorge "Quercus" Robles and Albert Schmaedick jumping for joy while crossing the Salty River. We joined this family for a soak in the river and then headed back home. All went well until we reached the small stream we had crossed on our way in. About halfway across, it became clear that something was very wrong. That stream is normally no more than 20 centimeters deep, but now water was splashing up and over the car's hood. “It's coming in under the doors!” shouted Albert. In the back seat, I looked at my feet and saw them disappear under a rising tide. Well, that left only one way out: through the windows. Fortunately, all three of us were wearing “water shoes.” I stuck my feet out the window and slid into the river. The water came up to my pockets. What could have caused this? Just at that moment, two cars arrived and a few minutes later there were seven of us, nearly up to our waists in muddy water, trying to push the car up and out of the river, grunting, sweating and cursing. But the car barely moved. “Are you sure it's in neutral?” shouted one of the men. “Sí, está en neutral,” replied Jorge...and then: “¡Caray... el freno!” Yes, we had actually moved that car uphill about two meters with the emergency brake on. With the brake off, we pushed it right out of the river and, to my surprise, the engine caught in less than a minute. Unfortunately, bailing out Jorge's car with coffee cups took a great deal longer, but in the end, it got us back home, happy, if not dry. Drive west out of Guadalajara on “libre” Highway 15 for 25 kilometers and turn southwest onto highway 70. After five kilometers you'll go under a pedestrian overpass. Immediately, make a left turn into the little town of Emiliano Zapata (N20.72017 W103.62735). You’ll see a fork in the road straight ahead of you. Keep right and you’ll be on a winding cobblestone road that will take you past the town plaza. Now the road becomes dirt (good quality) and 300 meters past the plaza, you come to a T where, again, you go right. Follow the main road south for 3.3 kilometers to Balneario Río Salado (N20.69207 W103.61322). Better use a high-clearance vehicle! Guava Beach is two kilometers southeast of here at N20.67922 W103.60266. This route is on Wikiloc.com under “GuadHikes - Hwy 70 to Rio Salado.” Driving time from Guadalajara to the balneario is about one hour.